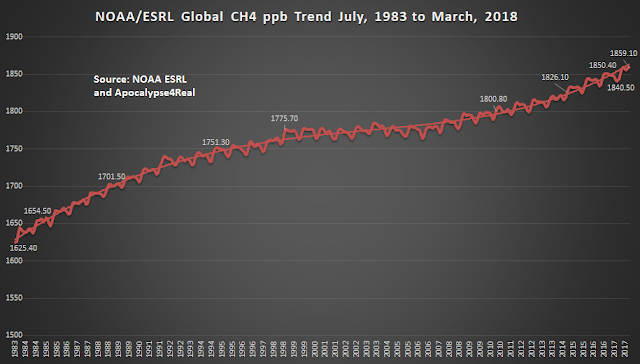 NOAA ESRL released its preliminary global mean CH4 on June 5 2018, with an initial reading of 1859.1 ppb. 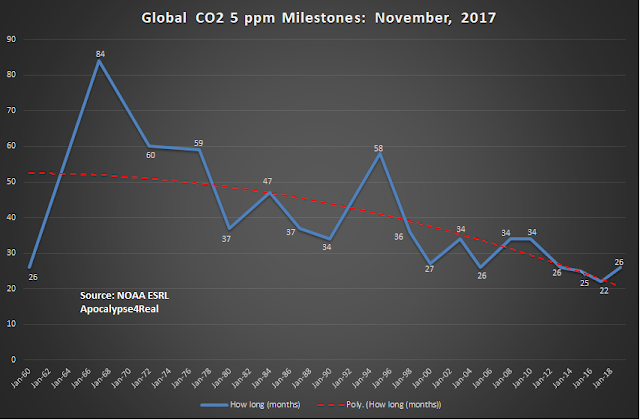 This mean was 11.2 ppb over March 2017. 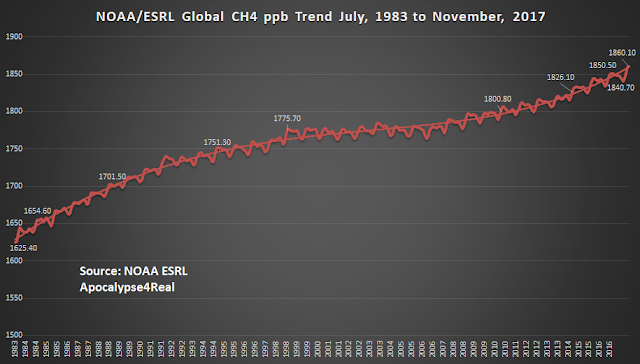 This continues the increase in global methane that has been observed globally by NOAA ESRL since 1983. 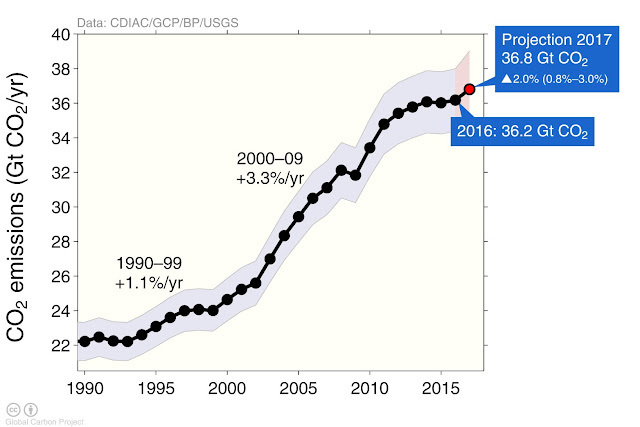 It is almost a 13.4% increase in global mean methane since March, 1984. 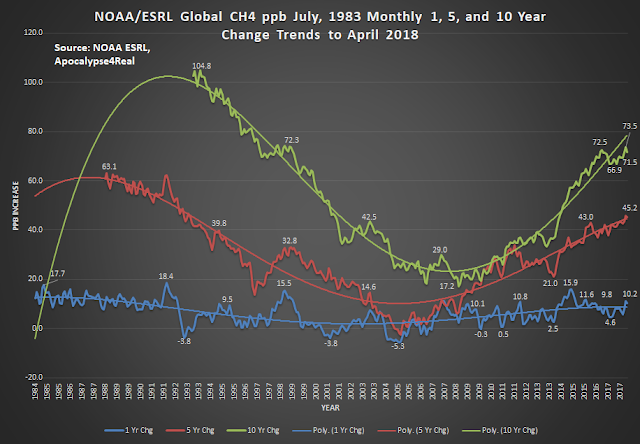 This month's 11.2 ppb increase over March 2017, represents the highest rate of increase since December 2015, and if the results remain above a 10 ppb increase in the coming months, as more samples are collected, it will be the first month with an increase above 10 ppb since July 2016. 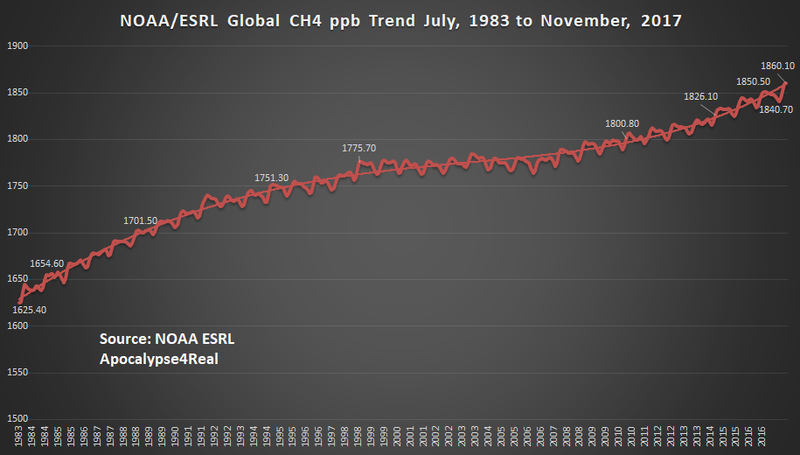 However, it is the longer trends that demonstrate the accelerating rate of increase of CH4 concentration in the atmosphere. Since March 2013, global mean CH4 has increased by 46.1 ppb, the highest rate of increase since the collapse of the Soviet Union, and the most since May, 1993. It is also the eleventh month of five year comparison increases over 40 ppb, last experienced in 1992-1993. 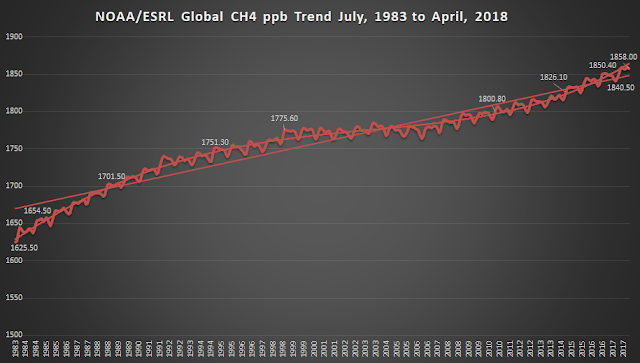 The ten year increase, since March, 2008 is 73.6 ppb. This is the highest 10 year change since March, 1999. It is obvious from the data and graphic, that methane continues to increase in concentration and reflects increasing global emissions. 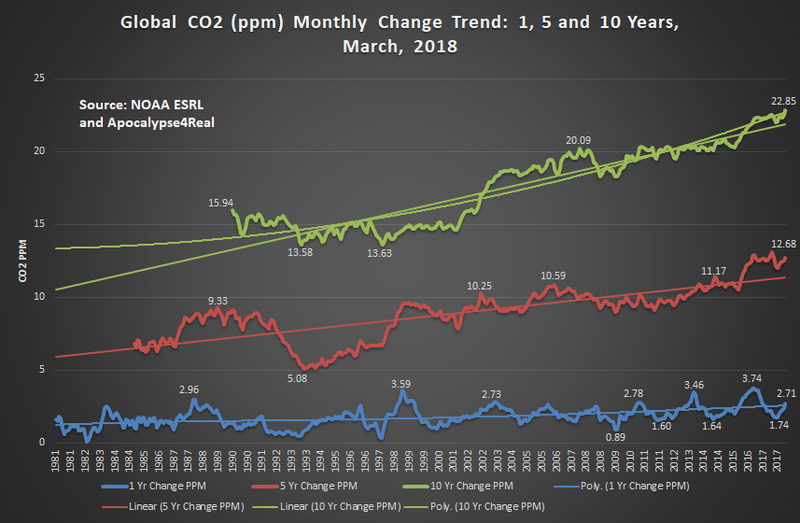 Recent research has attributed the methane increases primarily to growth in livestock production and changes in rainfall in the tropics. However, according to the USDA global markets report, there has not been a major increase in livestock (cattle or swine) production since 2014. 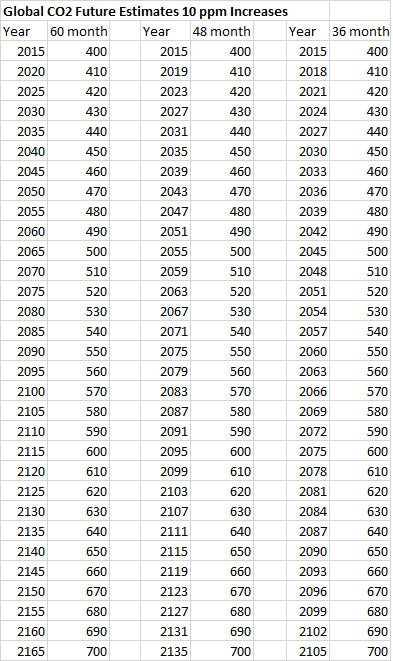 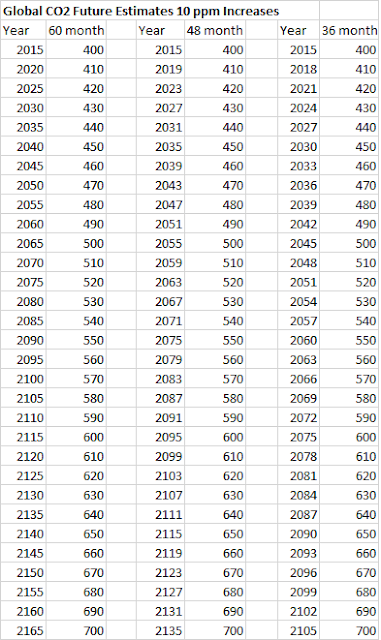 We have seen significant increases in CH4 concentration during that time. 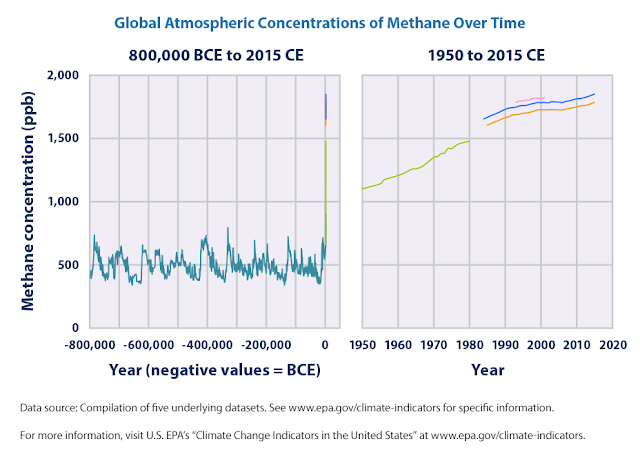 However more research is needed to localize sources and particularly to determine if natural gas production is making a higher contribution to changes in methane concentration. 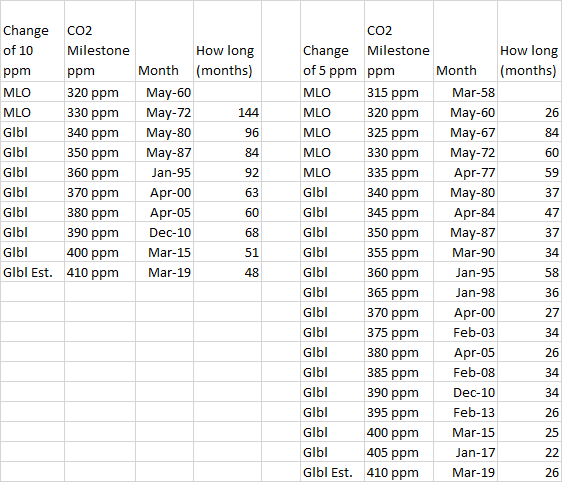 There may be other natural methanogenic sources that need further consideration, but that is another post. 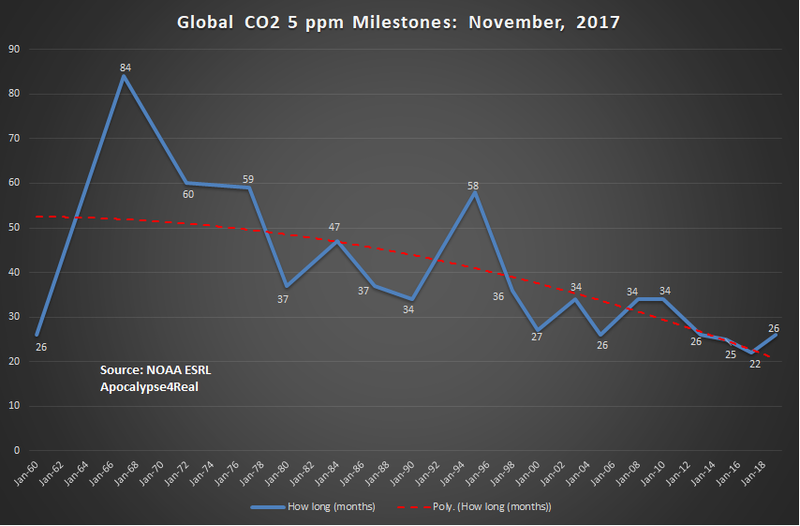 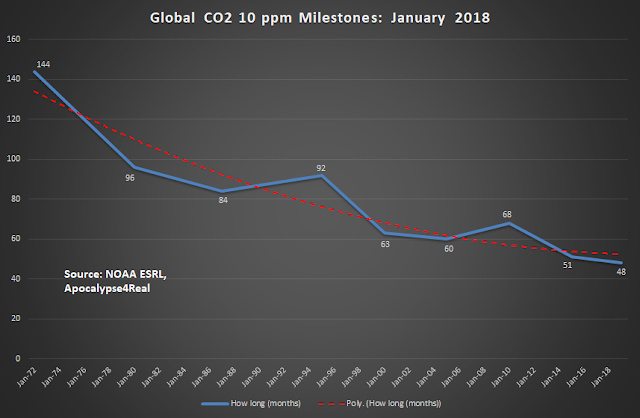 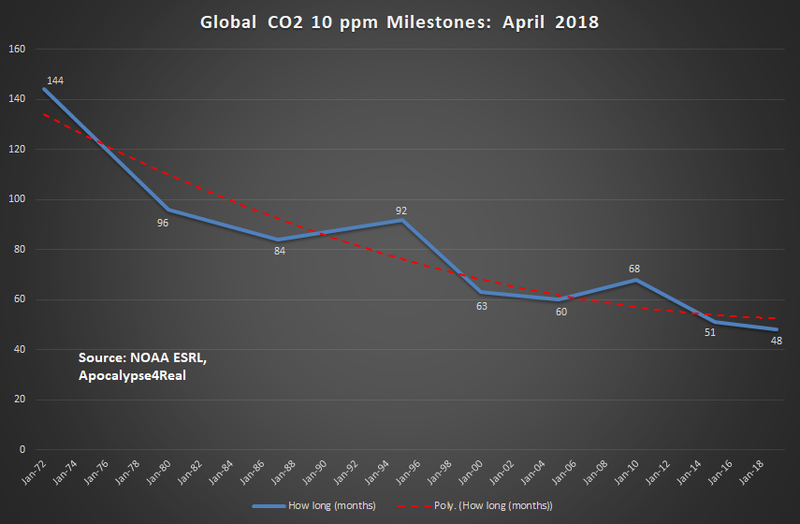 On June 5th, NOAA/ESRL announced the preliminary March 2018 global mean CO2 concentration was 408.75 ppm. 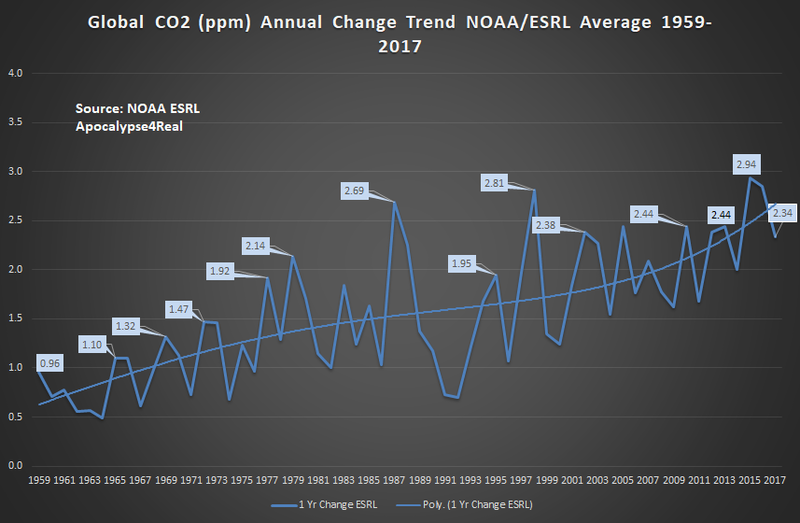 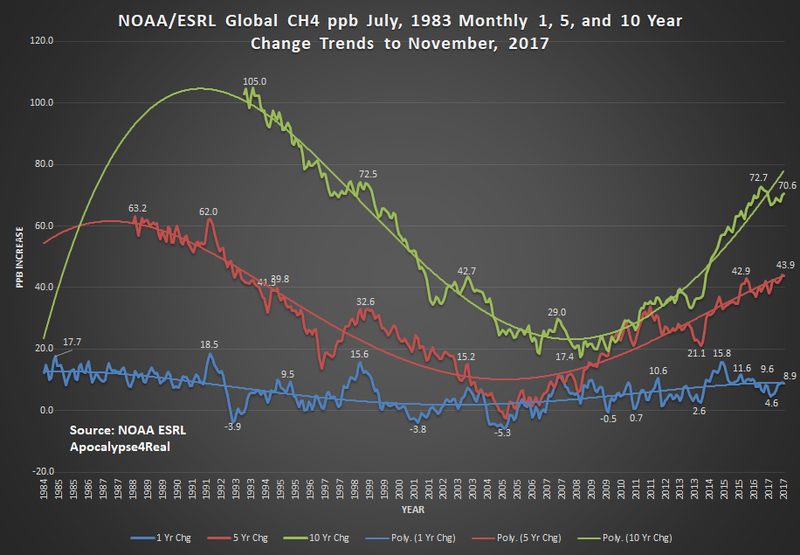 This was a concerning increase of 2.71 ppm over 2017. 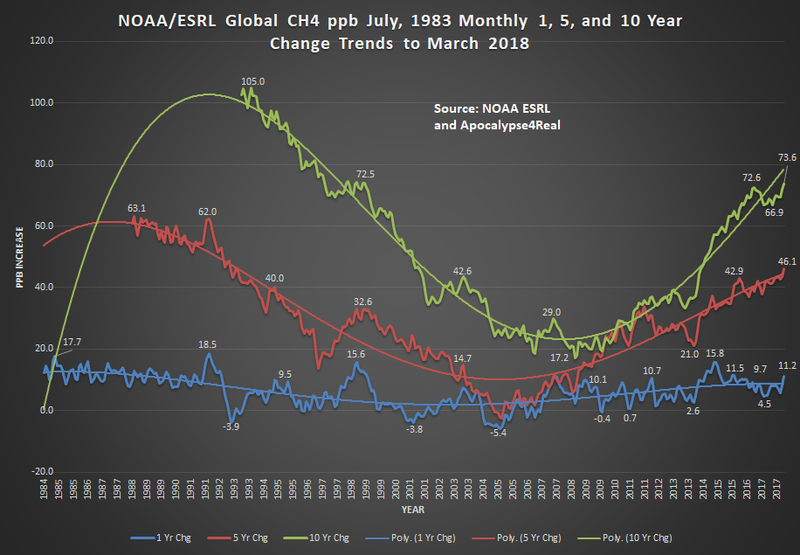 This rate of increase is of concern, since it is the highest monthly increase over prior year, that seems unrelated to an El Nino, and the highest monthly rate of increase since December, 2016. 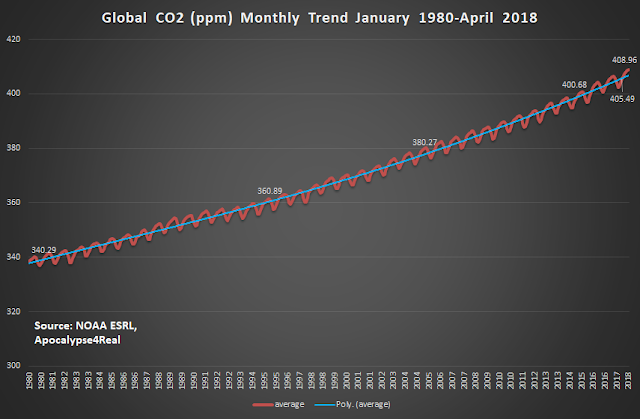 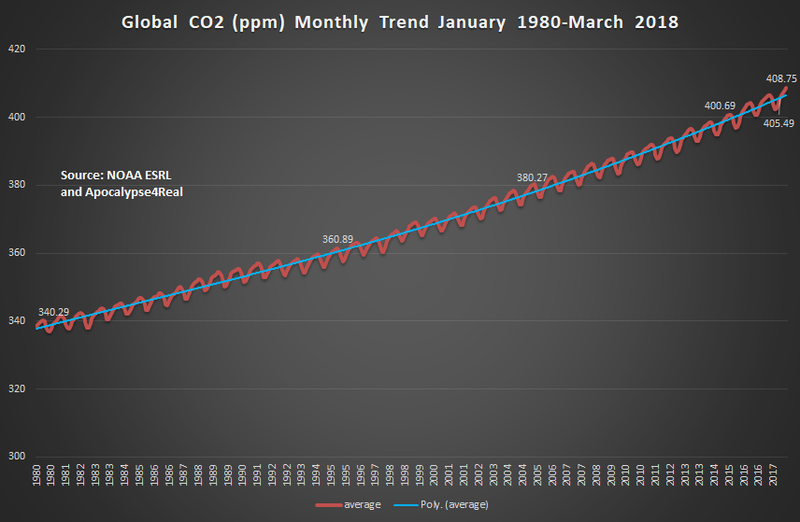 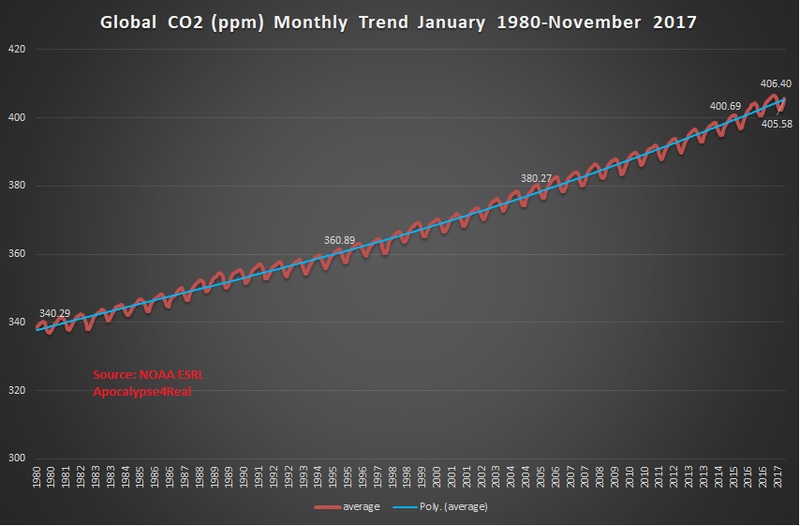 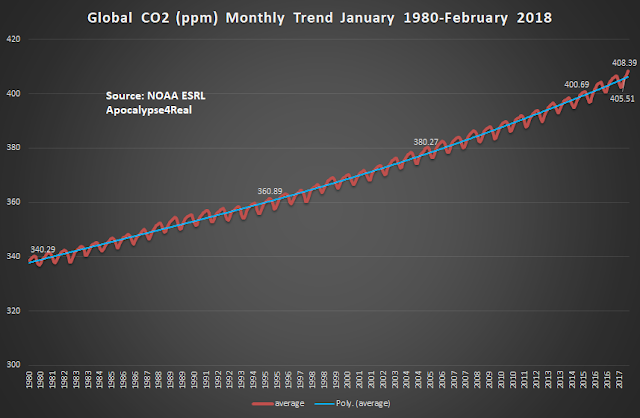 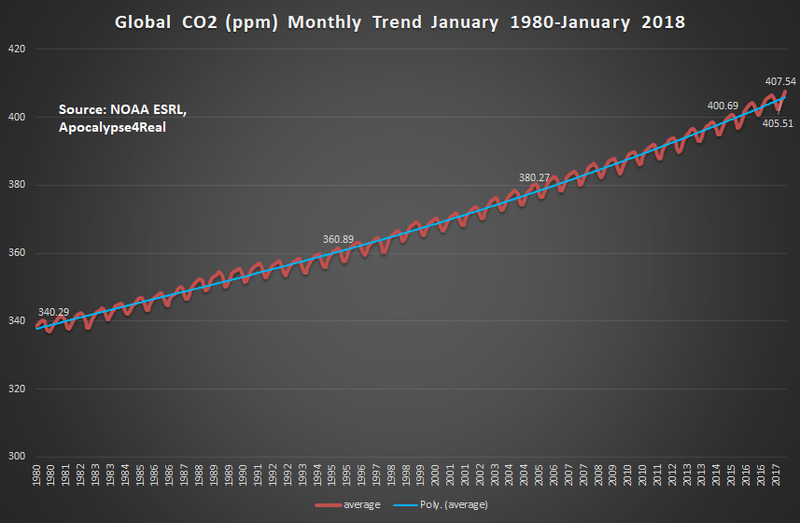 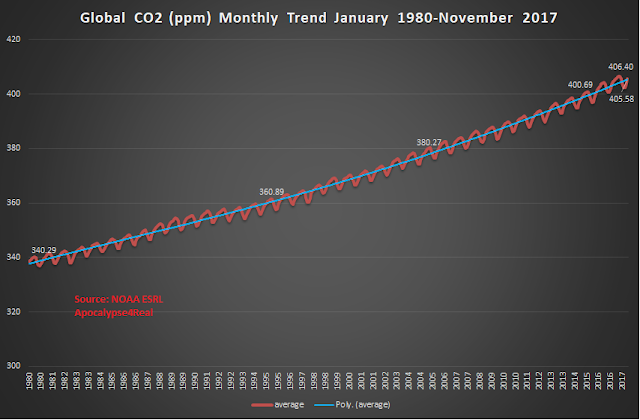 This CO2 concentration is another marker in the slowly accelerating rise observable in the monthly means since 1980. 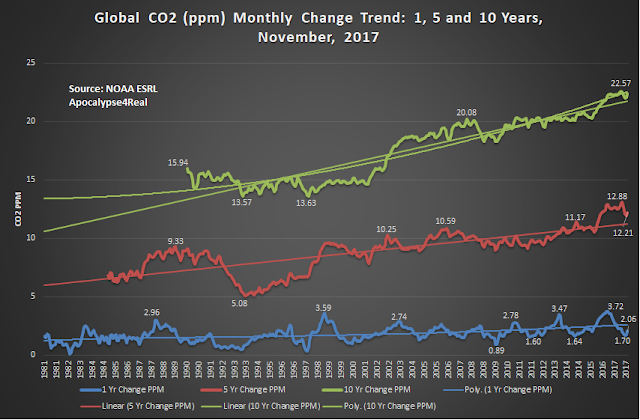 The acceleration is less apparent in the annual monthly mean change, than in the five or ten year change in CO2 concentration. 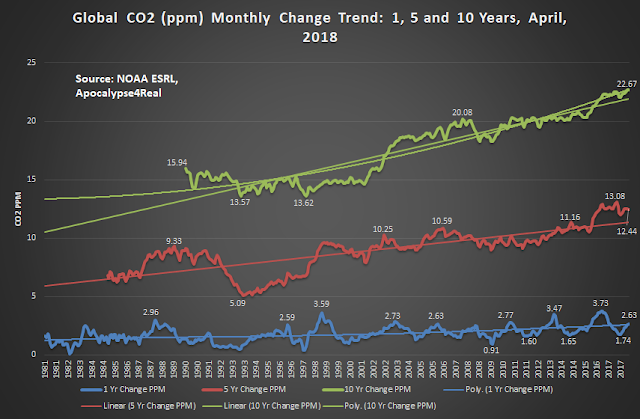 What is noticeable in the annual monthly mean change is that since 2009, there have been more and higher peaks in the trend than in years prior to 2009. 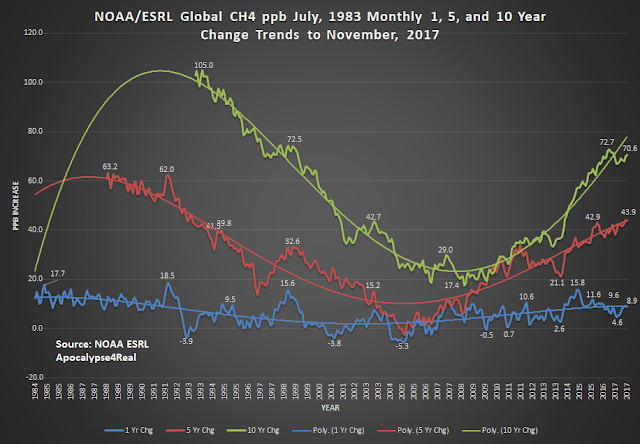 The five year change of 12.68 ppm continues the almost unbroken trend of months above a 12 ppm increase since March, 2016. 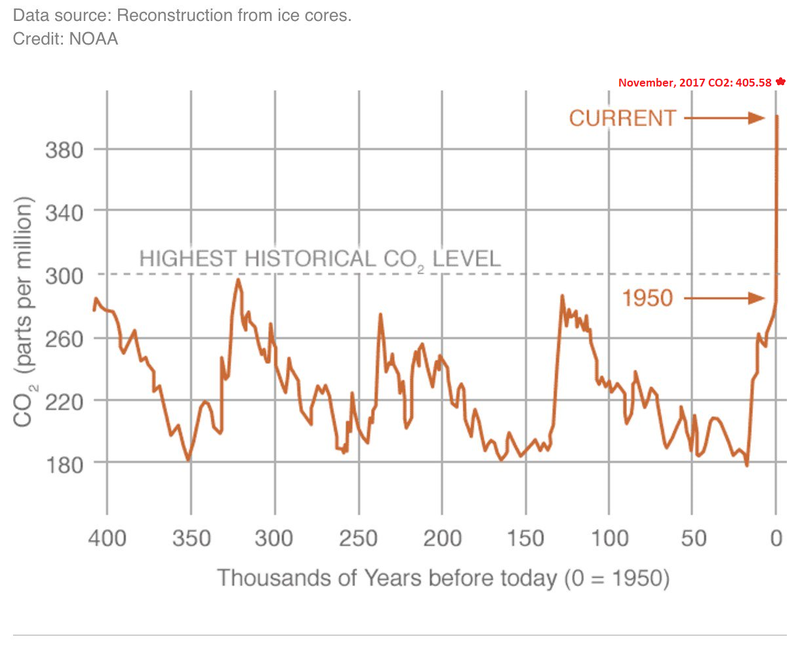 Where the increasing acceleration of CO2 concentration is most apparent is the increase over ten years. 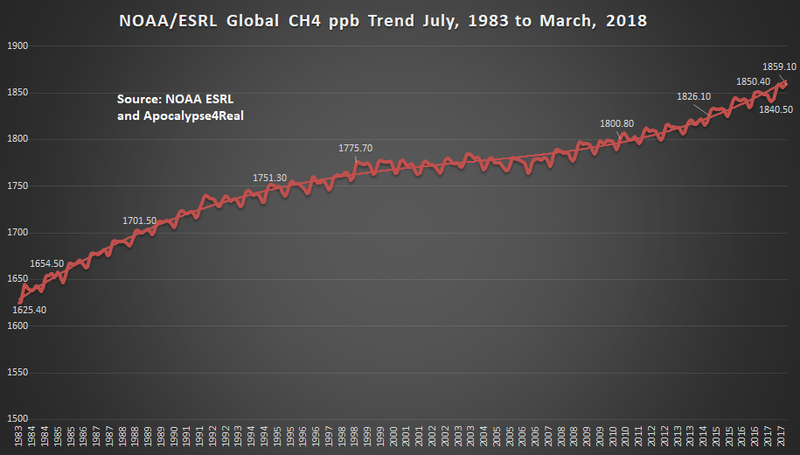 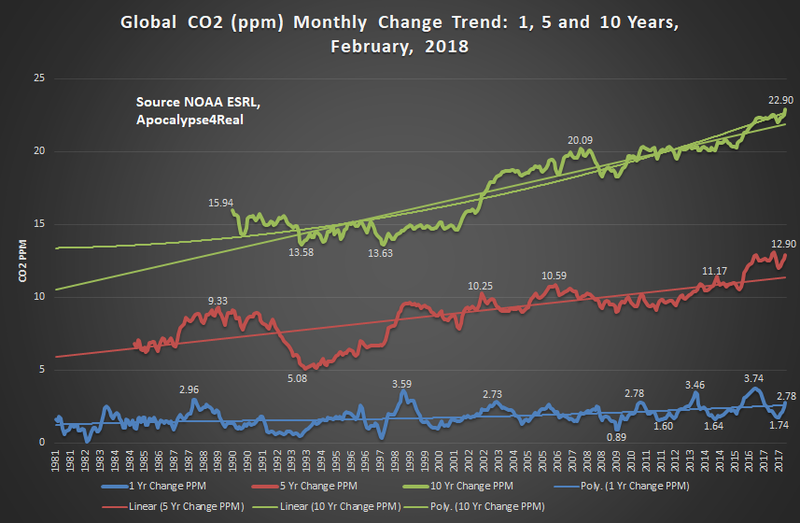 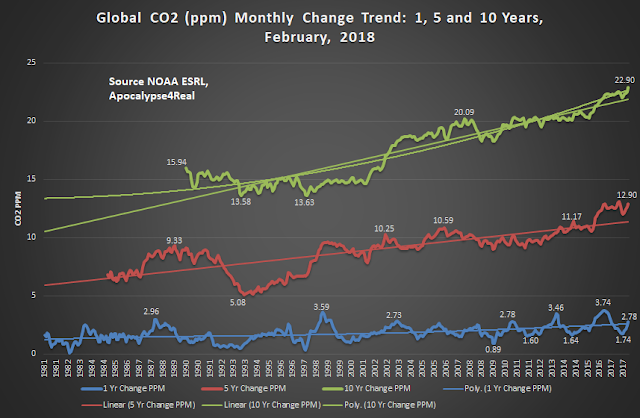 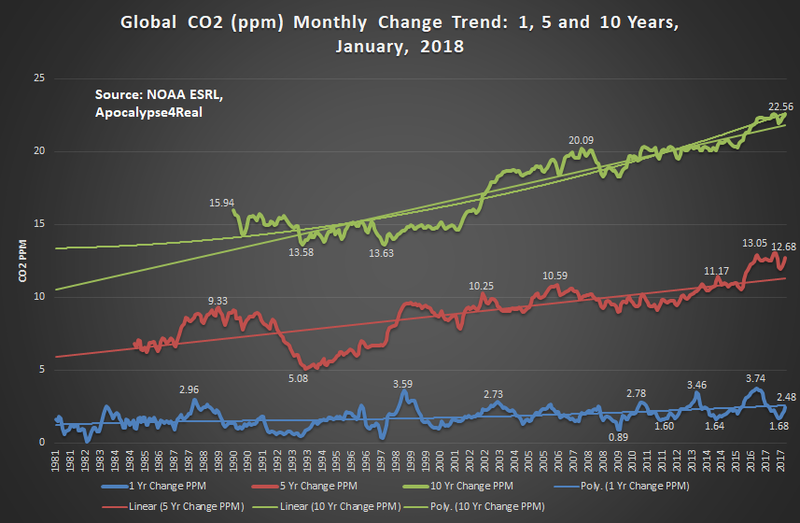 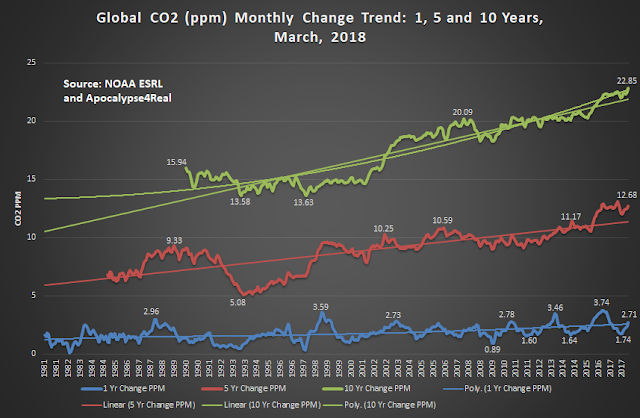 March 2018 is 22.68 ppm higher than 2008. This is the highest change of any month over one ten years before. 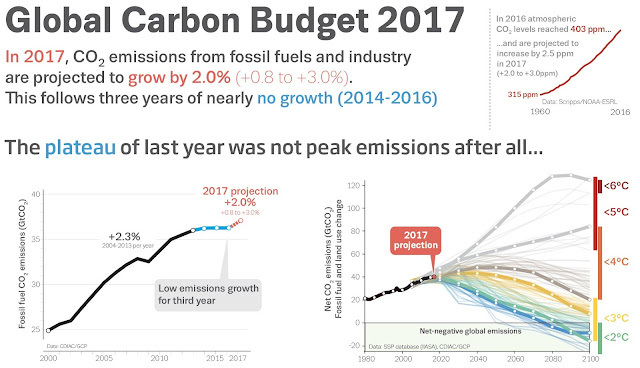 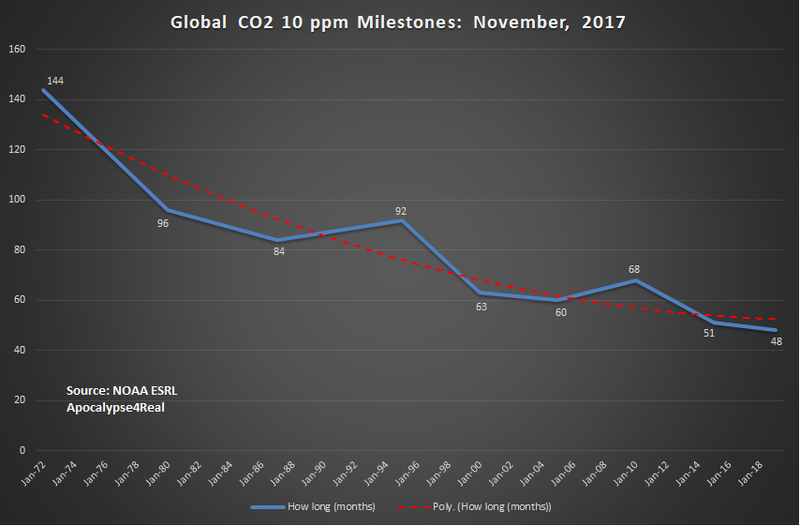 Given reports of annual increases in global anthroprogenic CO2 emissions this year over 2017, we can anticipate these monthly concentrations will continue to rise in year to come.